Q. How do I find case studies to use in my courses/with students? The National Center for Case Study Teaching in Science at http://sciencecases.lib.buffalo.edu/cs/ has some great resources. There are training resources (how to create and teach with case studies) as well as a collection of case studies. You could use the cases as idea generators. The cases themselves, however, are copyright protected. Check our eBooks via EBSCO collection for case study anthologies. Just search "case studies" and your topic keyword. Example: vaccination and case studies. If you don't find what you need/want, ask your School of Librarian to investigate the availability of case study resources in your area. S/he may be able to purchase materials that support your needs / the needs of your students. 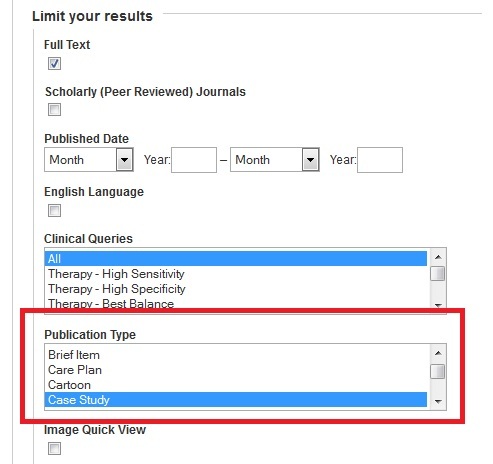 Check an article database in your subject area and limit your search to case studies only.